A crown is a “cap”, or a “cover” over a tooth. 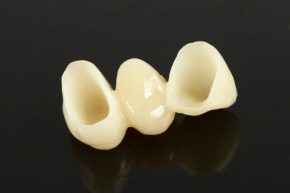 A bridge is a fixed prosthesis used to replace missing tooth/ teeth by joining the adjacent teeth/ implants with crowns. A crown can be made of metal, porcelain, a combination of both metal & porcelain, special plastics and glass. Your dentist will be able to advise you on the suitable type of crown according to your tooth condition. A crown usually require 2 visits to complete. 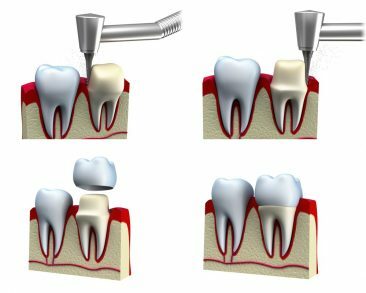 During the first visit, your dentist will “trim” the tooth to make space for the crown. An impression/ mould will be taken and sent to the laboratory, where the crown will be custom-made and manufactured. 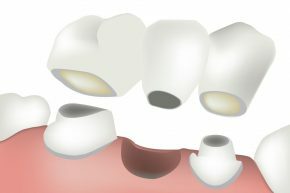 A temporary crown is often placed over the tooth in the meantime. 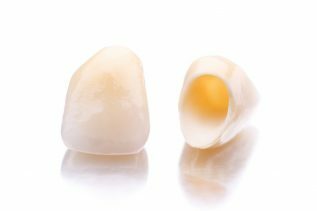 During the second visit, the finished crown will be cemented over the tooth. The completed crown will allow you to eat and smile confidently. The maintenance of the crown is similar to that of the normal tooth, i.e. proper brushing and flossing are required. A crown will provide you with years of service if you can maintain it well, and have it checked regularly by the dentist.